Billy Sherwood's The Fusion Syndicate came to be after he delivered The Prog Collective to Cleopatra Records. Founder Brian Perera suggested Sherwood do the same for a jazz/rock fusion album. The result is seven songs composed by Sherwood and performed by an A-list of musicians from the world of rock and jazz. A complete list of players and the track listing follows at the end. 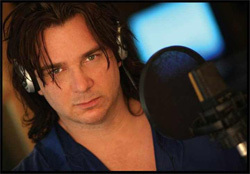 Billy Sherwood: stares you down. The formula for The Fusion Syndicate is rather basic: guitar, bass, drums, keyboards, and a horn of some kind, usually a saxophone, but Randy Brecker adds trumpet on At the Edge of the Middle. The arrangements are structured by with ample room for some improvisation. Sherwood wrote all the songs, and the produced, recorded, and mixed everything himself. I've always loved the whole jazz/rock fusion thing, having been introduced to it the late Seventies and early Eighties. While The Fusion Syndicate is sophisticated, it's not overly technical. Sherwood gives every song a lively accessibility, without being either overtly high brow or deceptively pedestrian. If you like melodic progressive rock, you'll find this music an agreeable cousin. 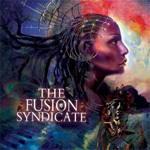 If you've never considered jazz/rock fusion, then The Fusion Syndicate is a fine introduction. Easily recommended. If you've never considered jazz/rock fusion, then The Fusion Syndicate is a fine introduction. If you like melodic progressive rock, you'll find this music an agreeable cousin.